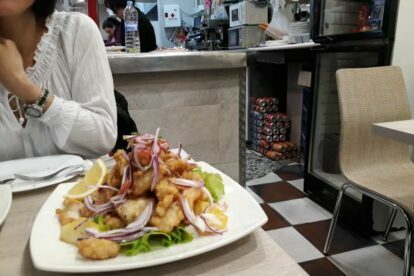 I’m fairly new to Peruvian food; what I’ve had has been delicious and surprising. There is clearly a fantastic food culture, and a well-defined cuisine. Madrid has quite a few great Peruvian restaurants that range from very fancy and quite pricey to modest little places like Cafeteria Lily. Don’t let the cheap prices fool you — these people take quality and consistency seriously. Being actually inside a market (you’ll find it on the first floor of the Mercado de Mostenses, just off the Gran Via) means that everything is really fresh, from the stall to your plate. A little twist is that the food at Lily is “Chifa”; a fusion of Chinese and Peruvian food. Alongside classics such as their ceviche (to die for) you’ll find noodle dishes and wonton soup. Red onions, cilantro, corn, chili and sweet potato feature, as do chicken and cheaper cuts of meat. There are some good fish options available too, but if you are a vegetarian, I must be honest, this is not the place for you. Everything comes in hearty portions suitable for sharing, and appears from the little kitchen very quickly. The owners are very proud of their place, which has been open for more than 8 years now, and it’s very popular — come early or be prepared to queue on a Saturday especially! The market is open until 14:00, but when it closes between then and 17:00 there is only one entrance open so you’ll need to be a little intrepid to find it!